Easy to communicate with, Maria arranged for her father to pick us up at the port. She upgraded us to the sunset suite and in minutes we were in the jacuzzi ready for our first sunset! There was a bottle of local wine every night for us to enjoy! And every morning the breakfast that was brought to our room was sumptuous! The suite is modern, the bed comfortable, the hot water plentiful, and the WiFi strong. Thira is the place to stay when coming to Santorini. Maria’s recommendations for eating places were right on! 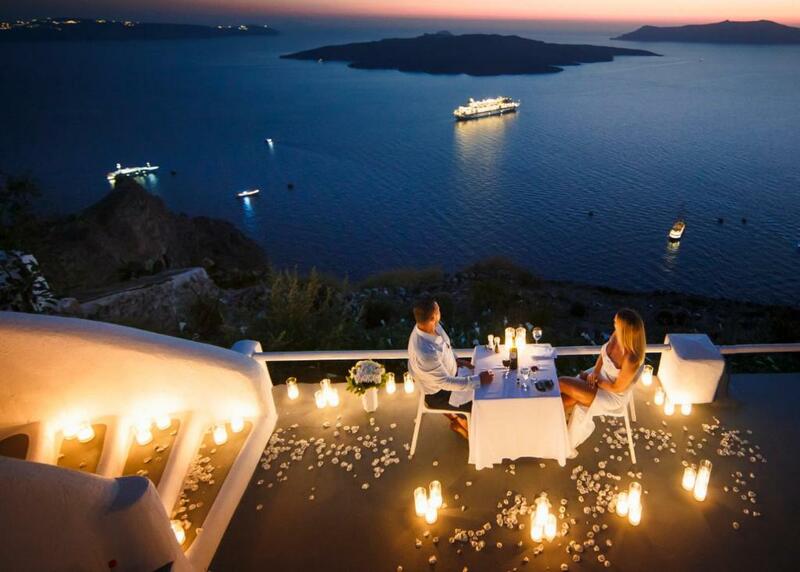 A very romantic place! There are three suites. One, which we rented, is very nice, private, recommended. They served breakfast in the room or on the patio daily and it was very good. People are friendly. The room was very comfortable and quiet, and we slept very well here. The view of the caldera from the terrace area is spectacular and everything you'd expect for a hotel in this location. It is far enough away from the main drag to be quiet, but is just a short walk to all the action. The breakfast is pretty good and it is served outside while we enjoyed the view. The hosts were very attentive. Having the shuttle to and from the airport/port is really helpful, since cabs aren't the easiest to come by in Santorini. The air conditioning worked well. Everything was just perfect! Definitely recommend it! Just beautiful views, a little to the edge of the bustle but only a few steps from everything you’d want in Thira. The host, Eri, was so helpful with everything, from arranging dinner reservations, transportation and communicating with us prior to arriving there. That picture is the breakfast that they served us right in front of our room... yup, not a bad scene to wake up to! Great property, room was comfortable and the breakfast was great! We definitely enjoyed the hot tub, but ours was not private - there was another hot tub for another suite on the same level. Staff assisted with our bags, which was very helpful as Fira has a lot of steps! Complimentary shuttle service to port was very helpful as well. We enjoyed our stay very much. Woke up every morning facing the caldera and lovely breakfast brought to us. Eri was very helpful, even lent me his SIM card to use as the phone shop was closed. Very quiet place and conveniently located. Would definitely recommend it. Lock in a great price for Asma Suites – rated 9.5 by recent guests! 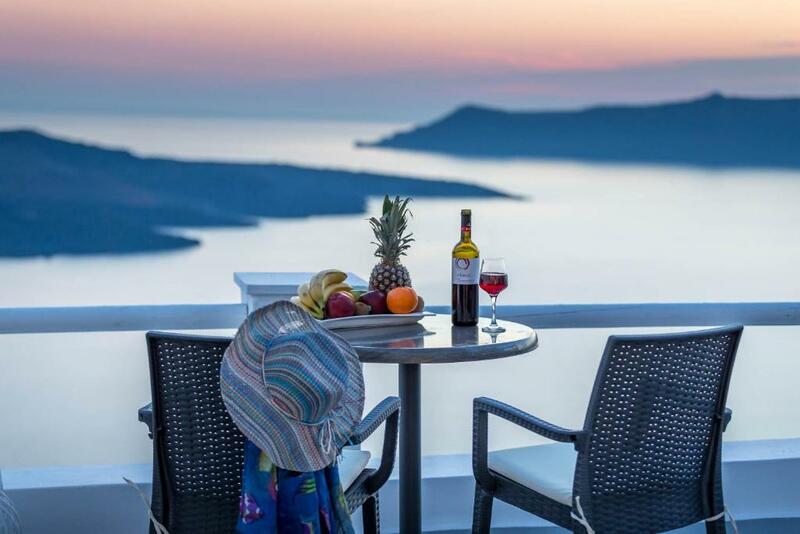 One of our top picks in Fira.Asma Suites offers free WiFi and elegantly furnished suites with a private hot tub, all in Fira on the Island of Santorini. This property is 1.9 mi from the Exo Gialos beach. Asma Suites is a 10-minute drive from Santorini Airport and a free shuttle bus from and to the airport can be organized on request. If you feel like visiting the surroundings, check out Megaro Gyzi (650 feet) and Bus Station (650 feet). Santorini (Thira) Airport is located 2.5 mi from the property. 뀐 Located in the real heart of Fira, this property has an excellent location score of 9.7! When would you like to stay at Asma Suites? Compact, elegantly furnished junior suite with free WiFi and an outdoor heated private hot tub. Has a seating area, a flat-screen satellite and cable TV and a balcony with views of Santorini caldera. Spacious, elegantly furnished suite with free WiFi and an outdoor heated private hot tub. Has a seating area, a flat-screen satellite and cable TV and a balcony with views of Santorini caldera. Very spacious, elegantly furnished suite with free WiFi and an outdoor heated private hot tub. Has a seating area, a flat-screen satellite and cable TV and a balcony with views of Santorini caldera. This suite has a tile/marble floor, cable TV and air conditioning. Asma Suites is a family unit and it is located in the centre of Fira, 100 metres from the Cathedral Church.We are two minutes walking distance from the main square of Fira and very close to the central bus and taxi station. 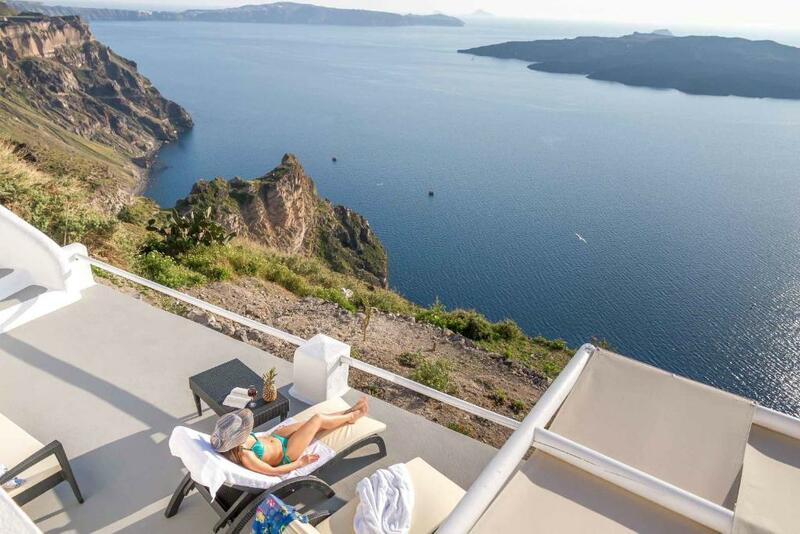 With stunning views to the volcanο and the caldera, Asma Suites provide a memorable stay for relaxation, combined with excellent hospitality. Our aim is to make you Fell Like Home (FLH) You will enjoy our fantastic breakfast with homemade pies and sweets every morning served in your suite or outside at your balcony. Asma Suites has also a private entrance where only guests can enter and nobody else can disturb them by taking photos, or admiring the view of Asma Suites. Maria and her family will do their best to enjoy your vacation. We will help you to organize excursions and we will give you information about the island. We can help you also to rent a car or ATV. Maria's hospitality is starting being famous according to our guests' reviews and she is keep doing her best to provide the famous Greek Hospitality to all her guests. We invite you to see how amazing is our FLH (Fell Like Home) hospitality. Asma Suites is located on the caldera, next of the famous Saint Minas Church. This church is the most famous church in Fira. At your terrace you will enjoy the sunset and the stuning view in a peacful enviroment with out the down town center's noise. On the other hand in two minutes walking distance you can go to the down town of Fira with all the clubs, restaurants shops etc Bus station and taxi station is also very close. House Rules Asma Suites takes special requests – add in the next step! Asma Suites accepts these cards and reserves the right to temporarily hold an amount prior to arrival. Please inform Asma Suites of your expected arrival time in advance. You can use the Special Requests box when booking, or contact the property directly using the contact details in your confirmation. Superb view from the room, delicious breakfast. The owner, Maria and her father John really helped us to make our holiday memorable one and we really appreciate it. I definitly reccomend this property if you want someting special in your journey. We stayed 4 nights which was perfect. If you needed longer or to cater for lunch or dinner you would need to get the bigger apartment as they are small rooms and have no microwave etc. The restaurants are expensive close b, but only a further 10 minutes away from the water you can get some descent food at local prices. If you struggle with steps this is not for yo, there are many to negotiate every day. This was such a beautiful get away. Run by a local family, it was worth it. The rooms were bright and newly renovated. The service was exceptional and very friendly. You get to have a beautiful breakfast overlooking the caldera on your patio in the warmer months. They catered for my dietary needs splendidly. The personal spas added the right touch but wished they were a little more private. Amazing view...special mention for host Maria and her dad. Wonderful host. Would like to stay again here in my next holiday. Host Maria upgraded our suite and my family was taken care of very well. Thank you maria. Breakfast was delicious, the view was awesome, unfortunately i couldn't use the jacuzzi cause the weather was not good. Alma offered me a tour by local person (Theodore) was perfect..!! The view was unbeatable!! You can see the amazing Caldera and beautiful sunsets. The breakfast is unbelievable I think I gained a few kilos!! Also you have a jacuzzi on the terrace. The owners are very kind and they helped us all the time. The personal service Maria offered. She organized a free fruit platter and wine for our honeymoon. Their breakfast was a spread and extremely delicious! The view was amazing ! Very little choice in breakfast for vegetarians. Everything was excellen at Asma Suites, nothing I didn't like. Just let people know about the one restaurant not to go to. Katrin Restaurant. Very poor. The service was extremely helpful and polite. View was second-to-none. Rooms were unreal. Entire place was clean and managed really well. Loved it and would go back in a heart beat! Our stay was excellent! 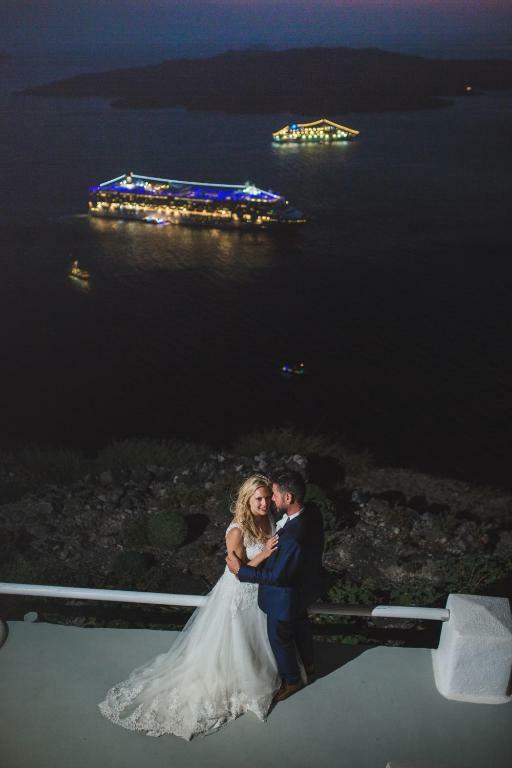 A perfect way to spend a few days on Santorini on our Honeymoon! The staff, views, location and breakfast was amazing! Such a beautiful place to stay in the heart of Fira. The staff truly does everything to make your experience great and is always available to help, even if he wasn't in the office. Every day our fridge was stocked with water, coffee and wine and the hot tub on the balcony was a cherry on top! Definitely would recommend! !